The Robert Wood Johnson Foundation’s Health Eating Research (HER) Program has released the new report: Better for You Foods: A Guide to Evaluating the Quality of Nutrition Standards. Retailers and other organizations currently use a variety of nutrition standards and recommendations to guide consumers towards healthier, “Better for You”, options. This variety can be confusing to consumers. HER convened a scientific advisory committee to review existing “Better-For-You” nutrition standards, and analyze their strengths and weaknesses.The committee developed a list of questions and criteria that can be used to evaluate these nutrition standards. 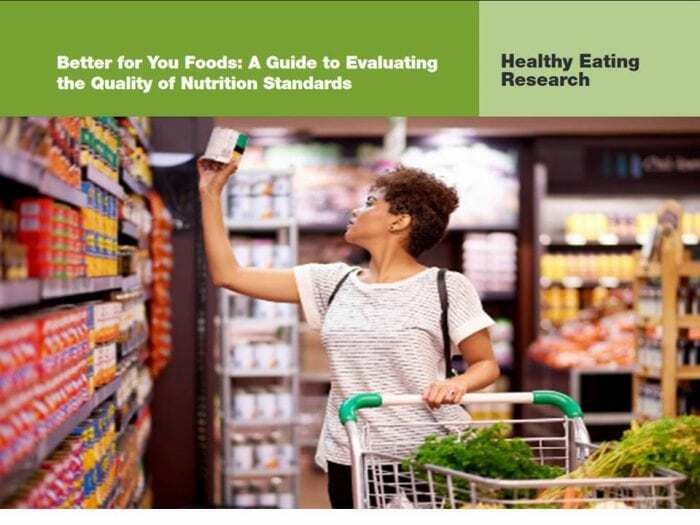 The report details the process used to review and evaluate “Better for You” nutrition standards, and the results from a preliminary implementation of this tool to review existing standards. The resulting tool, Assessing High Quality Nutrition Standards (AHQNS), considers how closely these standards align with the Dietary Guidelines for Americans. Excellent report. Education needs to be key here in nutrition. We cannot assume that everyone knows how to make healthy choices.